The renal glomerulus is one of the few sites within the microvasculature in which leukocyte recruitment occurs in capillaries. However, due to the difficulty of directly visualizing the glomerulus, the mechanisms of leukocyte recruitment to glomerular capillaries are poorly understood. To overcome this, we rendered murine kidneys hydronephrotic to allow the visualization of the functional glomerular microvasculature during an inflammatory response. These experiments demonstrated that following infusion of anti-glomerular basement membrane (GBM) Ab, leukocytes became adherent in glomerular capillaries via a process of immediate arrest, without undergoing prior detectable rolling. However, despite the absence of rolling, this recruitment involved nonredundant roles for the P-selectin/P-selectin glycoprotein ligand-1 and β2 integrin/ICAM-1 pathways, suggesting that a novel form of the multistep leukocyte adhesion cascade occurs in these vessels. Anti-GBM Ab also increased glomerular P-selectin expression and induced a P-selectin-independent increase in platelet accumulation. Moreover, platelet depletion prevented both the increase in glomerular P-selectin, and the leukocyte recruitment induced by anti-GBM Ab. Furthermore, depletion of neutrophils and platelets also prevented the increase in urinary protein excretion induced by anti-GBM Ab, indicating that their accumulation in glomeruli contributed to the development of renal injury. Finally, infusion of wild-type platelets into P-selectin-deficient mice restored the ability of glomeruli in these mice to support leukocyte adhesion. Together, these data indicate that anti-GBM Ab-induced leukocyte adhesion in glomeruli occurs via a novel pathway involving a nonrolling interaction mediated by platelet-derived P-selectin. It is well established that for leukocytes to leave the bloodstream and enter sites of inflammation, they must first undergo a sequence of interactions with the endothelium lining blood vessels at the target site (1). In general, leukocytes first make contact with the endothelium via the process of rolling. This interaction allows the leukocytes to respond to activating stimuli and subsequently arrest on the endothelial surface (2). Several studies in which leukocyte rolling has been inhibited or eliminated have demonstrated that the rolling interaction is critical in allowing leukocytes to undergo adhesion (3, 4, 5, 6). Moreover, direct examination of the microvasculature using in vivo microscopy has repeatedly demonstrated that these interactions occur almost exclusively in postcapillary venules, primarily because expression of the endothelial adhesion molecules which mediate leukocyte rolling, particularly P- and E-selectin, is restricted to these sites (7, 8). However, before arriving at postcapillary venules, leukocytes must pass through capillaries, undergoing deformation to enable their passage through these narrow vessels (9, 10). Despite the close apposition of the leukocyte and endothelial cell surfaces brought about by this deformation, leukocytes are rarely observed to undergo adhesion in capillaries. However, there is a growing body of evidence that this paradigm does not apply in all capillary beds. Leukocyte recruitment to capillary-like vessels has been observed in hepatic sinusoids, pulmonary capillaries, and in the glomerulus (11, 12, 13). The glomerular capillary bed in particular is a common target of injurious leukocyte recruitment during nephritogenic immune responses (14, 15, 16). Despite this, the mechanisms whereby leukocytes adhere in this unique capillary bed are poorly understood. Several adhesion molecules have been observed to contribute to recruitment in this site (17, 18, 19, 20). Antagonism of the β2-integrin/ICAM-1 adhesion pathway has been observed to be effective at reducing glomerular leukocyte recruitment in several studies, suggesting that conventional pathways which mediate leukocyte arrest are functional in the glomerular microvasculature (17, 18, 19, 21). In contrast, the necessity for the rolling step, and indeed the roles in the glomerulus of the adhesion molecules that normally mediate leukocyte rolling remain unclear. P-selectin inhibition has been shown to reduce glomerular leukocyte recruitment and renal injury, suggesting that P-selectin-mediated rolling interactions contribute to efficient glomerular leukocyte recruitment (20, 22). In contrast, other work has shown that P-selectin-deficient (P-selectin−/−) mice have increased levels of glomerular recruitment and renal damage, suggesting that not only is P-selectin not required, it may actually inhibit glomerular leukocyte recruitment (23, 24). None of these studies directly assessed interactions between circulating leukocytes and glomerular endothelial cells. Consequently, the effect of these interventions on rolling and adhesion, and indeed the requirement for rolling within the glomerulus remain unknown. Therefore, the aim of this study was to examine the molecular mechanisms of leukocyte recruitment to the glomerulus, using intravital microscopy to directly assess the glomerular microvasculature. To achieve this aim, we made use of the technique of renal hydronephrosis. This approach overcomes the difficulty of visualizing structures deep in the renal cortex by eliminating much of the renal medulla and rendering the remaining cortex transparent, while maintaining glomerular perfusion (25). Direct visualization of glomeruli in these experiments has demonstrated that leukocyte recruitment to the glomerulus occurs via a novel pathway involving overlapping roles for the β2-integrin/ICAM-1 pathway, P-selectin, and platelets in the absence of detectable rolling in glomerular capillaries. C57BL/6 wild-type mice were purchased from the Walter and Eliza Hall Institute (Melbourne, Australia), and P-selectin−/− mice on a C57BL/6 background (The Jackson Laboratory) were bred in-house. All experimental procedures were approved by the Monash University Animal Ethics Committee. Sheep anti-mouse-glomerular basement membrane (GBM)3 Ab was prepared as described previously, except that murine cortices were sonicated following homogenization (26). Normal sheep globulin (sheep Ig), prepared from nonimmune sheep serum using the same protocol, served as a control Ab. Abs used for immunohistochemistry were as follows: FITC-conjugated goat anti-mouse C3 (Cappel); FITC-conjugated rabbit anti-sheep IgG (Cappel); FITC-conjugated sheep anti-rabbit IgG (Sigma-Aldrich); polyclonal rabbit anti-human P-selectin (20); RB6-8C5 (anti-Gr-1); and FA-11 (anti-CD68). Abs used in vivo were 2E6, a hamster mAb against murine CD18 (2 mg/kg); YN1/1.7.4, a rat mAb against murine ICAM-1 (2 mg/kg); RB40.34, a rat mAb against murine P-selectin (20 μg per mouse; BD Biosciences); 2PH1, a rat mAb against murine P-selectin glycoprotein ligand-1 (PSGL-1) (2 mg/kg; BD Biosciences); and rabbit anti-mouse thrombocyte serum (Accurate Chemical & Scientific). Male mice (4–5 wk old) were anesthetized via inhalation of Ethrane (Abbott Australasia). A midline incision was made, and the ureter of the left kidney was ligated twice with 6/0 nonabsorbable silk and divided. The incision was closed, and 12 wk allowed for the kidney to undergo hydronephrosis. Mice were anesthetized by i.p. injection of ketamine hydrochloride and xylazine, as described previously (27). The jugular vein was cannulated for the administration of further anesthetic and other reagents. Animals were maintained at 37°C on a heating pad. The hydronephrotic kidney was exteriorized through a lateral incision, drained of urine using a 30-gauge needle, and extended over a clear viewing platform using 4/0 silk tied to the kidney capsule. The kidney was superfused with bicarbonate-buffered saline (pH 7.4) (37°C) and covered with a coverslip. The renal microvasculature was observed with an intravital microscope (Axioplan 2 Imaging; Carl Zeiss) with a water immersion ×20 objective (×20/0.50 NA). Leukocyte recruitment to glomeruli was induced by administration of anti-GBM Ab (20 mg/mouse, i.v.). To visualize leukocytes, mice were injected with 50 μl of 0.05% rhodamine 6G (Sigma-Aldrich), and the tissue was examined via epifluorescence at 520–560 nm, using a 590-nm emission filter. Images were visualized using a low-light video camera (Dage-MTI IR-1000; SciTech) and recorded for playback analysis using a videocassette recorder. Three to four randomly chosen glomeruli were recorded at intervals throughout the experiment and subsequently analyzed for leukocyte adhesion. A leukocyte was defined as adherent if it remained stationary within the glomerulus for at least 30 s (27). In experiments investigating adhesion molecule function, Abs against various adhesion molecules were administered i.v. 5 min before i.v. administration of anti-GBM Ab. To examine the role of platelets, platelet depletion was achieved via injection of rabbit anti-mouse thrombocyte serum (15 μl, i.p.) 4 h before anti-GBM Ab (28). In some experiments, neutrophils were isolated from mouse bone marrow using Percoll density centrifugation, as described previously (29). Neutrophil purity was assessed using costaining for Gr-1 and CD11b and routinely observed to be in the range of 90–95% (30). Isolated neutrophils were labeled with CFSE (Molecular Probes) and resuspended in PBS at 107/ml. Hydronephrotic mice were prepared for renal intravital microscopy, and 50-μl boluses of neutrophils were administered via a catheter inserted in the left carotid artery, advanced to the aorta. Neutrophils were observed by epi-illumination at 450–490 nm, using a 515-nm emission filter. In additional experiments, interactions of isolated neutrophils were examined in postcapillary venules of the cremaster muscle, prepared for intravital microscopy as described previously (31). In these experiments, an inflammatory response was established in the cremaster muscle by prior local injection of TNF (50 ng, 4 h), then neutrophils were delivered to the cremasteric microvasculature via a catheter inserted retrogradely in the femoral artery. Deposition of sheep Ig, C3, and P-selectin expression were compared in hydronephrotic and contralateral kidneys using immunohistochemistry. Kidneys were snap frozen in OCT, and 6-μm cryostat sections were prepared. Staining for sheep Ig, C3, and P-selectin was performed as described previously, using FITC-conjugated anti-sheep Ig, FITC-conjugated anti-C3, and rabbit anti-P-selectin in combination with FITC-conjugated anti-rabbit IgG, respectively (26, 32). Quantitative assessment of glomerular staining of these parameters was performed using image analysis. Sections were examined on a Leica BMLB Laboratory microscope with a ×40/0.70 NA objective lens. Images were captured with a Leica DC 300F digital camera using Photoshop CS software (Adobe Systems) at predefined exposure and gain levels. The mean fluorescence intensity within the glomerular tuft minus background intensity in unstained tissue was determined using Scion Image (National Institutes of Health Image) (33). For sheep Ig and C3 levels, between five and 35 glomeruli were assessed per mouse, whereas P-selectin expression was quantitated in 20–50 glomeruli per animal. For identification of leukocytes in glomeruli, cryostat sections were prepared from periodate lysine paraformaldehyde-fixed kidneys, and sections were stained for neutrophils (anti-Gr-1; mAb RB6-8C5) and macrophages (anti-CD68; mAb FA-11) using a three-layer immunoperoxidase technique as described previously (14, 34). To assess platelet accumulation in inflamed glomeruli, mice were injected with anti-GBM Ab, and after 2 h, nonadherent platelets were removed by successive perfusion with PBS and periodate lysine paraformaldehyde. Platelets were detected in cryostat sections using a two-layer staining protocol using rabbit anti-thrombocyte serum (1 μg/ml) followed by FITC-conjugated sheep anti-rabbit IgG (1/50). Individual platelets within glomeruli were counted in 30–50 glomeruli per animal. Platelets were isolated from mouse whole blood as described previously (35). Platelets from either wild-type or P-selectin−/− mice were transferred into hydronephrotic P-selectin−/− mice (or wild-type mice treated with anti P-selectin Ab) via i.v. injection. Platelets from one donor were used to supply platelets for two recipient mice. To examine the contribution of neutrophils and platelets to renal injury, before treatment with anti-GBM Ab, mice were depleted of neutrophils, using RB6-8C5 (anti-Gr-1, 150 μg/mouse, i.p.) (36), or of platelets, using anti-platelet serum as already described. Control anti-GBM Ab-treated mice were treated with identical amounts of rat IgG or rabbit serum, respectively. Subsequently, renal injury was assessed by measurement of proteinuria as described previously. Briefly, mice were placed on metabolic cages for 16 h, and urine was collected throughout this period. Urinary protein was assessed via Bradford assay and expressed as mg/24 h (26). All data presented are shown as the mean ± SE. Student’s t tests or one-way ANOVA was performed to compare experimental groups. p values <0.05 were considered significant. The aim of the first series of experiments was to determine whether the process of hydronephrosis had markedly altered either the ability of anti-GBM Ab to accumulate in the glomerulus or the level of the subsequent inflammatory response. The dose of anti-GBM Ab used (20 mg) was chosen based on pilot experiments to determine the lowest dose capable of consistently inducing renal injury as determined by analysis of urinary protein excretion. 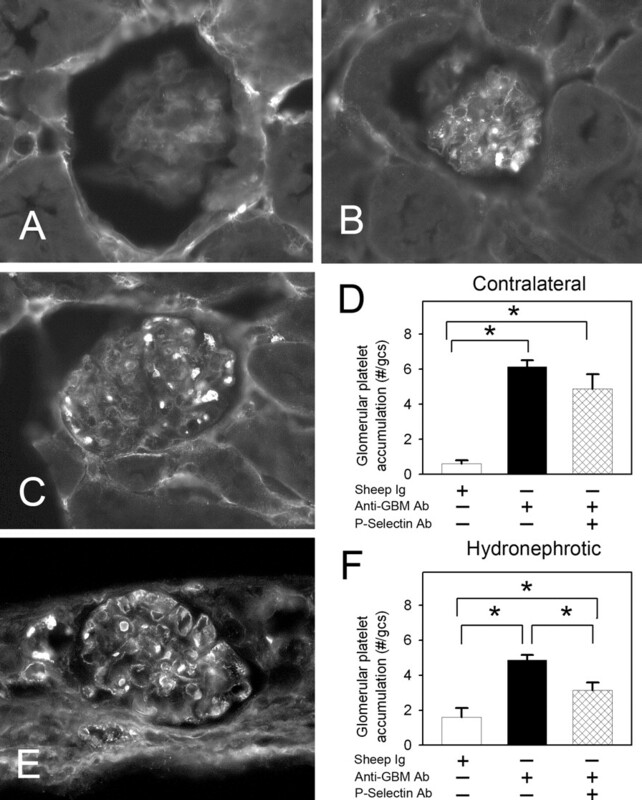 Comparison of hydronephrotic and contralateral nonhydronephrotic kidneys from the same mice 1 h after anti-GBM Ab administration demonstrated that the amount of anti-GBM Ab bound by glomeruli did not differ between hydronephrotic and contralateral kidneys (Fig. 1⇓A). In addition, both C3 deposition (Fig. 1⇓B) and the increase in expression of P-selectin (Fig. 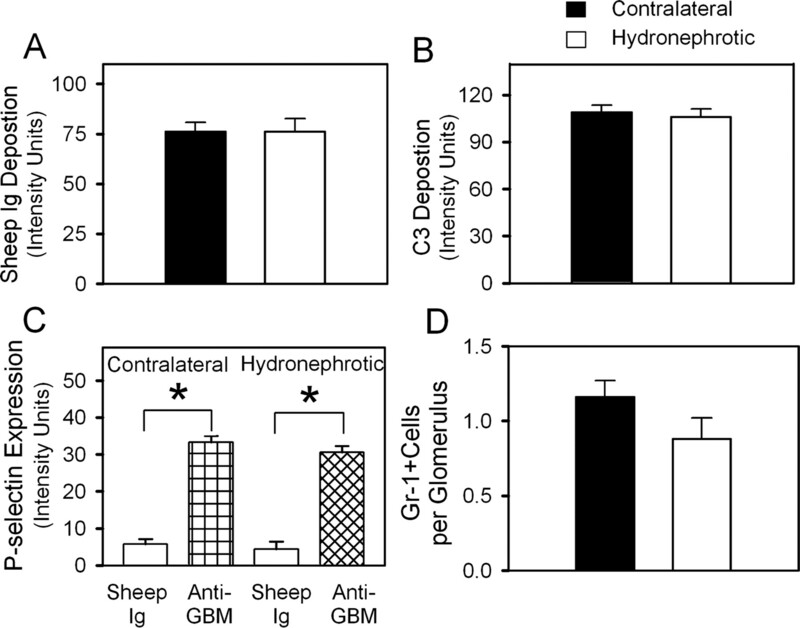 1⇓C) induced by anti-GBM Ab were comparable in hydronephrotic and nonhydronephrotic kidneys. Examination of the types of leukocytes in normal and hydronephrotic kidneys revealed that Gr-1+ve (neutrophils) and CD68+ve (monocytes) leukocytes were rarely observed in untreated glomeruli (data not shown). Two hours after anti-GBM Ab administration, the number of Gr-1+ve cells in glomeruli increased significantly in both normal and hydronephrotic kidneys (Fig. 1⇓D). Anti-GBM Ab treatment did not increase the number of CD68+ve cells in glomeruli in either kidney (data not shown). Together, these data indicate that hydronephrosis did not dramatically alter deposition of anti-GBM Ab or the ability of the glomerular vasculature to respond to anti-GBM Ab and induce neutrophil recruitment. Comparison of the response to inflammatory stimulation in hydronephrotic and contralateral (nonhydronephrotic) kidneys. Immunohistochemistry was used to compare sheep Ig deposition (n = 6) (A), complement deposition (C3) (n = 5–8) (B), P-selectin expression (n = 5/group) (C), and neutrophil recruitment (n = 10) (D) in hydronephrotic and nonhydronephrotic kidneys. Anti-GBM Ab was administered, then tissues were prepared for immunohistochemistry 60 min later for A–C, whereas for D, tissue was prepared 120 min after anti-GBM Ab administration. A–C were stained using fluorescence immunohistochemistry, and image analysis was performed to quantitate glomerular expression. Data represent intensity units above background. Gr-1-positive cells in glomeruli (D) were counted in sections stained using conventional immunohistochemistry. Data are shown as mean ± SEM. ∗, Denotes p < 0.05 relative to sheep Ig-treated kidneys. We next used intravital microscopy to examine the process of anti-GBM Ab-induced leukocyte recruitment. Before anti-GBM Ab, leukocytes were visible passing rapidly through the glomerular capillary loops. However, no leukocytes were adherent within glomeruli. Following anti-GBM Ab administration, there was a significant increase in leukocyte adhesion within glomeruli at 60 min, with a further increase at 120 min (Fig. 2⇓). The absence of marked leukocyte accumulation in control mice treated with sheep Ig demonstrated that the processes of hydronephrosis, surgical exteriorization, and brief periods of fluorescent illumination used were not sufficient to induce leukocyte recruitment. Anti-GBM Ab-induced leukocyte adhesion as assessed by intravital microscopy. 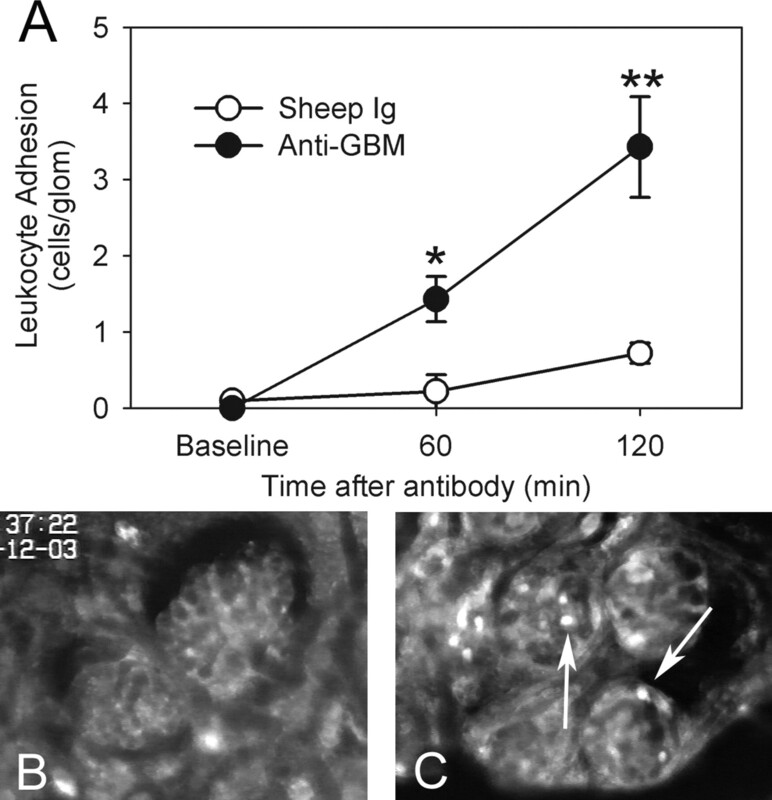 A, Leukocyte adhesion in glomeruli of mice treated with sheep Ig (n = 6) or anti-GBM Ab (n = 6) before, and 60 min and 120 min posttreatment. Also shown are captured images of glomeruli before (B), and 2 h after (C) anti-GBM Ab administration, showing recruited leukocytes (arrows) within the glomerular vasculature following anti-GBM Ab administration. Data are shown as mean ± SEM. ∗, Denotes p < 0.05 vs sheep Ig at 60 min. ∗∗, Denotes p < 0.01 vs sheep Ig at 120 min. Evidence from tissues such as the liver has indicated that the necessity for leukocyte rolling can be bypassed in some tissues, particularly those with unique microvasculature architecture (11). Therefore, we examined glomeruli in hydronephrotic kidneys during the anti-GBM Ab-induced response to determine whether leukocyte rolling was detectable. In animals in which all leukocytes were stained with rhodamine 6G, rotational movement of leukocytes along the endothelial surface in inflamed glomeruli was not observed. In contrast, leukocytes were commonly observed to deform to pass through glomerular capillaries. In addition, some leukocytes were observed to arrest transiently (<1 s) before detaching and re-entering the bloodstream, whereas others were observed to undergo immediate arrest and remain adherent. To study this process in more detail, experiments were performed with CFSE-labeled isolated neutrophils infused directly into the renal circulation. Following anti-GBM Ab treatment, neutrophils commonly underwent immediate arrest on passage through glomerular capillaries, in many cases subsequently undergoing rapid deformation to the shape of the surrounding vasculature (Fig. 3⇓). In mice treated with anti-GBM Ab, the rate of primary arrest was greater than double that observed in mice treated with sheep Ig (Fig. 4⇓A). Given the possibility that the process of neutrophil isolation altered the adhesive characteristics of these cells, we examined their behavior in the cremasteric microvasculature, in which leukocytes routinely roll and adhere in postcapillary venules. When infused directly into the inflamed cremaster muscle, neutrophils passed through capillaries without arrest, but readily underwent rolling and adhesive interactions in postcapillary venules (Fig. 4⇓B). These findings demonstrate that the inability of these cells to roll in glomerular capillaries was not due to a loss of this capacity associated with the isolation procedure. These observations support the contention that the conventional multistep paradigm of leukocyte recruitment is not required for leukocyte adhesion in the glomerular microvasculature. Neutrophils undergo immediate arrest in glomerular capillaries following anti-GBM Ab treatment. A–E represent individual frames at the indicated time intervals after entry of a CFSE-labeled neutrophil into the glomerular plexus (dotted line indicates glomerular outline). In A and B, the neutrophil enters the glomerulus (at top left) and moves rapidly through a glomerular capillary. In C, the neutrophil has arrested and no longer moves through the capillary, but in the following seconds changes shape within the vessel (D and E). Adhesion of bone marrow-derived isolated neutrophils within inflamed glomeruli. A, Neutrophils were infused directly into kidneys of mice 30 min after treatment with either sheep Ig (n = 9) or anti-GBM Ab (n = 7). The rate of neutrophil arrest was significantly elevated in glomeruli of anti-GBM Ab-treated mice. ∗, Denotes p < 0.05 vs sheep Ig-treated mice. B, Captured image of cremasteric microvasculature following local intra-arterial infusion of CFSE-labeled neutrophils. Isolated neutrophils were directly infused in the inflamed (TNF, 50 ng, 4 h; n = 3) cremasteric microvasculature via a catheter inserted retrogradely into the femoral artery. In contrast to glomerular capillaries, neutrophils passed through cremasteric capillaries without undergoing arrest. However, they retained the capacity to undergo rolling and adhesive interactions in postcapillary venules (V). Previous work has implicated the β2 integrin/ICAM-1 pathway in mediating leukocyte recruitment in experimental glomerulonephritis. Similarly, in the current study, inhibition of either CD18 or ICAM-1 reduced leukocyte recruitment to basal levels, at 60 and 120 min, an effect not seen in mice treated with isotype control Abs (Fig. 5⇓). The effect of anti-CD18 on neutrophil recruitment was also assessed in nonhydronephrotic contralateral kidneys using immunohistochemistry. Anti-CD18 also caused a significant reduction in the numbers of Gr-1+ve cells in glomeruli in nonhydronephrotic kidneys (anti-GBM Ab alone: 1.16 ± 0.11 neutrophils/glomerular cross-section (n = 10) vs anti-GBM + anti-CD18: 0.76 ± 0.03 neutrophils/glomerular cross-section (p < 0.05; n = 8)). Role of CD18 and ICAM-1 in anti-GBM Ab-induced leukocyte adhesion within glomeruli. 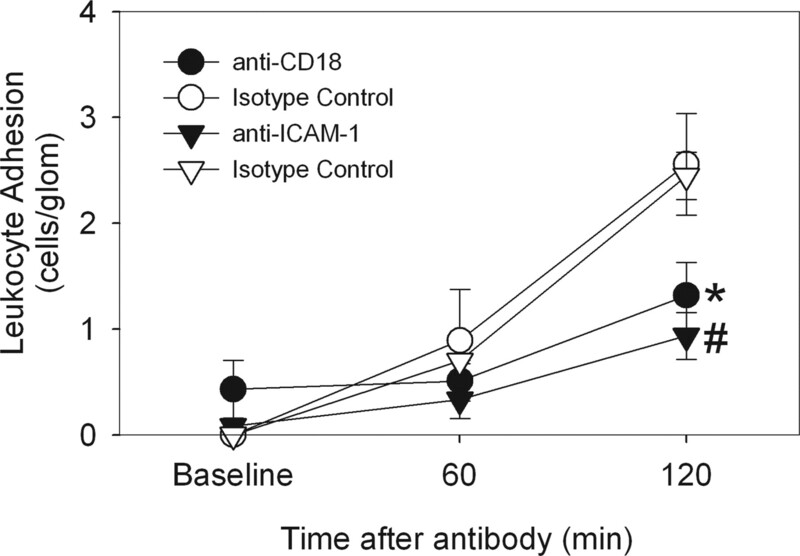 Mice were treated with anti-GBM Ab and anti-CD18 (n = 6) or anti-ICAM-1 (n = 6) or their respective isotype controls (n = 3 for each), and leukocyte adhesion was assessed at 60 and 120 min. Data are shown as mean ± SEM. ∗ and #, Denote p < 0.05 vs isotype control at 120 min. We next examined the role of the P-selectin/PSGL-1 pathway in anti-GBM Ab-induced glomerular leukocyte recruitment. Blockade of P-selectin or PSGL-1 in wild-type mice reduced leukocyte recruitment to baseline levels (Fig. 6⇓A). Similar results were obtained in anti-GBM Ab-treated P-selectin−/− mice (Fig. 6⇓A). This was confirmed using immunohistochemical analysis of kidneys from anti-P-selectin Ab-treated mice, which showed that the number of glomerular neutrophils was reduced significantly in both contralateral and hydronephrotic kidneys (Fig. 6⇓B). Finally, similar observations were obtained in intravital microscopy experiments in which isolated CFSE-labeled neutrophils were transferred into mice treated with anti-GBM Ab and anti P-selectin (wild-type: 0.52 ± 0.10 neutrophils/glomerulus (n = 7); wild-type + anti-P-selectin: 0.10 ± 0.06 (n = 4)) (Fig. 6⇓, C and D). It is noteworthy that this role for P-selectin was observed in the absence of detectable leukocyte rolling. Role of the P-selectin/PSGL-1 pathway in anti-GBM Ab-induced leukocyte adhesion within glomeruli. A, Wild-type mice were treated with anti-GBM Ab (n = 6), or anti-GBM Ab plus either anti-P-selectin (n = 6) or anti-PSGL-1 (n = 4), and leukocyte adhesion was assessed via intravital microscopy at 60 and 120 min. Also shown are P-selectin−/− mice (n = 6), following treatment with anti-GBM Ab. Data are shown as mean ± SEM. ∗, Denotes p < 0.05 vs all other groups at 60 and 120 min. B, Immunohistochemical assessment of the effect of P-selectin blockade on anti-GBM Ab-induced glomerular neutrophil recruitment in both hydronephrotic and contralateral kidneys (n = 5 for both groups). Data show effect of anti-P-selectin, expressed as a percentage of anti-GBM Ab alone (data in Fig. 1⇑). #, Denotes p < 0.05 vs mice treated with anti-GBM Ab alone. 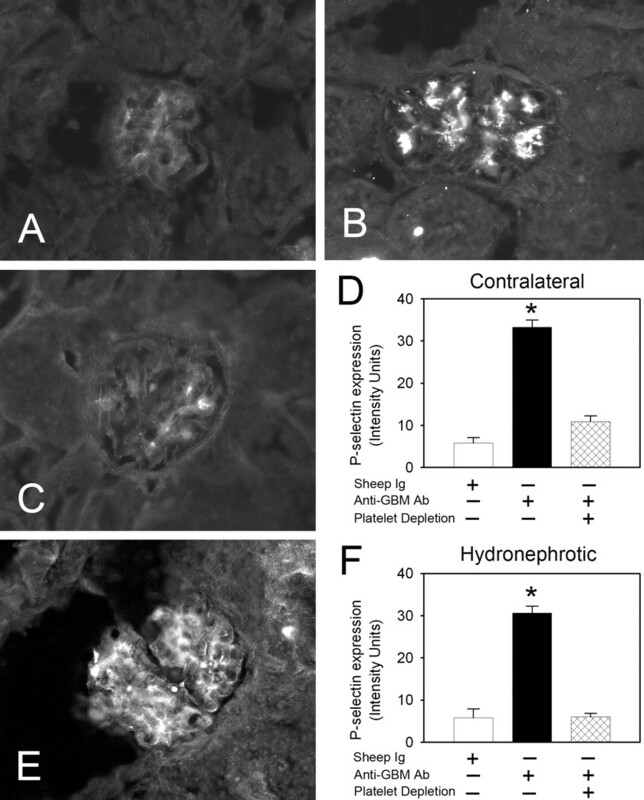 C and D, Captured glomerular intravital microscopy images following transfer of 2.5 × 105 CFSE-labeled neutrophils into a kidney treated with anti-GBM Ab alone (C) or anti-GBM Ab and anti-P-selectin Ab (D). Glomerular neutrophil adhesion is markedly reduced by treatment with anti-P-selectin Ab. Given the fact that capillary endothelial cells lack the capacity to express P-selectin (7, 8), it is conceivable that platelets were acting as a source of glomerular P-selectin expression. To assess this possibility, we first examined glomerular platelet accumulation in response to anti-GBM Ab, using immunohistochemistry. Anti-GBM Ab infusion significantly increased the number of platelets detectable within glomeruli, in both contralateral and hydronephrotic kidneys (Fig. 7⇓). In nonhydronephrotic kidneys, platelet accumulation did not require P-selectin because this process was not reduced by P-selectin blockade (Fig. 7⇓, C and D). However, in hydronephrotic kidneys, P-selectin blockade did result in a small but significant reduction in platelet accumulation (Fig. 7⇓F). We next examined the effect of platelet depletion on anti-GBM Ab-induced glomerular P-selectin expression. Following treatment with platelet-depleting serum, which reduced circulating platelet counts by over 97% without altering circulating leukocyte counts (data not shown and Ref. 28), glomerular P-selectin expression in anti-GBM Ab-treated mice was reduced to a level comparable to that seen in sheep Ig-treated mice (Fig. 8⇓). The effects of this treatment were indistinguishable in hydronephrotic and contralateral kidneys (Fig. 8⇓, D and F). This suggested that platelets were acting as the dominant source of P-selectin in this system. Therefore, we next examined the effect of platelet depletion on glomerular leukocyte recruitment. Platelet-depleted mice showed minimal leukocyte recruitment in response to anti-GBM Ab (Fig. 9⇓A), indicating that platelets are critical to this model of glomerular leukocyte recruitment. Accumulation of platelets in glomeruli following anti-GBM Ab administration. Intraglomerular platelets were detected via immunohistochemistry, following removal of nonadherent platelets via PBS perfusion (A–D, contralateral kidneys; E–F, hydronephrotic kidneys). The number of platelets per glomerulus (D and F) was quantified in mice treated with sheep Ig, anti-GBM Ab, and anti-GBM Ab + anti-P-selectin (n = 5–6 mice/group). Platelets were rarely detected in glomeruli of mice treated with control sheep Ig (A, D, F), whereas significant platelet accumulation was observed following anti-GBM Ab administration (B and D–F). In contralateral kidneys, treatment with anti-P-selectin Ab had no effect on anti-GBM Ab-induced platelet accumulation (C and D), whereas this treatment reduced platelet accumulation in hydronephrotic kidneys (F). Data are shown as mean ± SEM. ∗, Denotes p < 0.05 vs indicated groups. Role of platelets in glomerular P-selectin expression (A–D, contralateral kidneys; E–F, hydronephrotic kidneys). Image analysis of P-selectin expression was performed in mice treated with sheep Ig, anti-GBM Ab alone, or anti-GBM Ab following platelet depletion (3–5 mice/group) (D and F). In glomeruli of mice treated with sheep Ig, P-selectin expression is negligible (A, D, and F). In contrast, after administration of anti-GBM Ab, glomerular P-selectin is markedly up-regulated in both contralateral (B and D) and hydronephrotic glomeruli (E and F). In platelet-depleted mice treated with anti-GBM Ab, P-selectin expression is reduced to a level comparable to that in sheep Ig-treated mice (C, D, and F). Data are shown as mean ± SEM. ∗, Denotes p < 0.05 vs sheep Ig-treated mice. Platelets promote glomerular leukocyte recruitment via platelet-derived P-selectin. A, Absence of leukocyte recruitment in platelet-depleted mice. Wild-type mice (n = 6), or mice depleted of platelets (n = 6) were treated with anti-GBM Ab, and leukocyte adhesion was assessed via intravital microscopy at 60 and 120 min. Also shown are mice treated with rabbit Ig (control for platelet depletion serum; n = 3) before anti-GBM Ab administration. ∗, Denotes p < 0.05 vs platelet-depleted mice at 120 min. B, Platelet transfer demonstrates a role for platelet P-selectin in anti-GBM Ab-induced glomerular leukocyte adhesion. Platelets were infused into mice that were subsequently treated with anti-GBM Ab, and leukocyte adhesion was assessed over the following 60 min via intravital microscopy. Leukocyte adhesion is shown for wild-type mice infused with P-selectin−/− platelets, then treated with anti-P-selectin and anti-GBM Abs (n = 6). Also shown is adhesion in P-selectin−/− mice infused with wild-type platelets followed by anti-GBM Ab (n = 4). Significant leukocyte adhesion is only observed in the presence of platelets capable of P-selectin expression. Data are shown as mean ± SEM. ∗, Denotes p < 0.05 vs P-selectin−/− platelets at 60 min. Given the fact that both P-selectin and platelets contribute to glomerular leukocyte recruitment, and platelet accumulation does not require P-selectin, this raised the possibility that platelets were acting as the source of P-selectin necessary for leukocyte recruitment. To test this hypothesis, we performed platelet transfer experiments between wild-type and P-selectin−/− mice and assessed anti-GBM Ab-induced leukocyte adhesion. In anti-GBM Ab-treated wild-type mice pretreated with anti-P-selectin Ab, leukocyte adhesion remained low following infusion of P-selectin−/− platelets (Fig. 9⇑B). 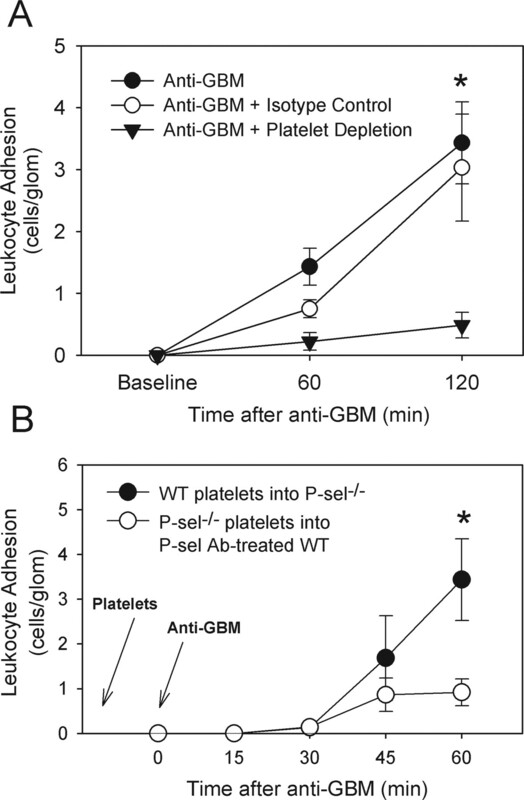 In contrast, infusion of wild-type platelets into anti-GBM Ab-treated P-selectin−/− mice restored adhesion to levels similar to that seen in wild-type mice (Fig. 9⇑B), indicating that platelet P-selectin is critical for anti-GBM Ab-induced leukocyte adhesion within glomerular capillaries. To determine whether the observed glomerular accumulation of neutrophils and platelets contributed to glomerular injury, we examined the effects of anti-GBM in mice depleted of neutrophils and platelets, using urinary protein excretion as a readout of glomerular injury. As previously observed, anti-GBM Ab induced a significant increase in proteinuria at 24 h (Fig. 10⇓) (20). Depletion of neutrophils with anti-Gr-1 eliminated the anti-GBM Ab-induced increase in protein excretion. Similarly, anti-GBM Ab failed to increase protein excretion in mice depleted of platelets (Fig. 10⇓). These data indicate that neutrophils and platelets recruited to glomeruli in response to anti-GBM Ab are important contributors to the resultant glomerular injury. Effect of depletion of either platelets or neutrophils on anti-GBM Ab-induced glomerular injury, as assessed by measurement of urinary protein excretion. 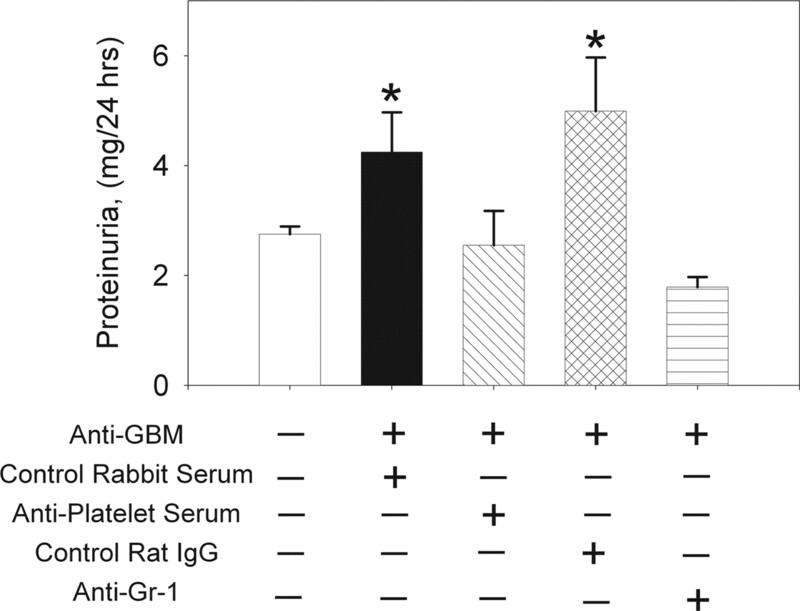 Mice were treated with anti-platelet serum or anti-Gr-1 (to deplete neutrophils) before treatment with anti-GBM Ab. Results were compared with those from mice treated with anti-GBM Ab plus either rabbit serum (as control for anti-platelet serum; n = 9) or rat IgG (150 μg, as control for anti-Gr-1; n = 7). Urine was collected continuously from 8 to 24 h after administration of anti-GBM Ab. Mice treated with anti-GBM Ab and control se rum/Ab displayed significant increases in proteinuria, relative to the amount in untreated mice (n = 25). Depletion of either neutrophils (n = 9) or platelets (n = 7) eliminated the anti-GBM Ab-induced increase in urinary protein excretion. Data are shown as mean ± SEM. ∗, Denotes p < 0.05 vs untreated group. Recruitment of leukocytes to the glomerulus is a critical step in the development of glomerulonephritis (14, 15, 16). This is remarkable in that the glomerular microvasculature is essentially a capillary plexus, and in most vascular beds, leukocyte recruitment does not occur in capillaries. Given the difficulty of directly visualizing the glomerulus in living animals, the exact nature of the leukocyte-endothelial cell interactions responsible for recruitment to this bed have been difficult to elucidate. Evidence from histological studies has demonstrated a role for adhesion molecule-mediated leukocyte recruitment to glomeruli (17, 18, 19, 20, 21, 37). Moreover, findings such as the inhibitory effect of P-selectin blockade on leukocyte recruitment have suggested that the conventional sequence of rolling preceding adhesion applies in glomerular vessels (20, 22). However, this has never been demonstrated directly. Therefore, to determine the nature of the interactions that enable leukocyte recruitment to glomerular capillaries, we visualized glomeruli in the posthydronephrotic kidney during a glomerular inflammatory response. These experiments demonstrated that leukocyte recruitment to inflamed glomeruli can occur without an initial rolling interaction. In contrast, leukocytes undergo immediate arrest in glomerular capillaries. However, despite the absence of detectable leukocyte rolling, the P-selectin/PSGL-1 pathway plays a key role in mediating leukocyte arrest in glomerular capillaries, indicating that leukocyte recruitment to the glomerulus occurs via a novel pathway involving selectin-mediated interactions other than conventional rolling. Previous studies have suggested that platelets contribute to glomerular injury, but their effects on leukocyte recruitment are less consistent (38, 39). The data in the present study indicate that in this model of glomerular inflammation, platelets recruited to the glomerulus play a key role in promoting leukocyte recruitment and glomerular injury, via provision of P-selectin that subsequently mediates leukocyte adhesion. It is noteworthy that platelets have been observed to promote recruitment in inflamed postcapillary venules in a number of tissues (28, 35, 40), in some cases acting as a source of P-selectin important in mediating platelet-leukocyte interactions (35, 40). However, these studies all examined interactions in postcapillary venules, where leukocyte rolling is critical to recruitment. The present study is the first to demonstrate a key role for platelet P-selectin in mediating leukocyte recruitment to inflamed capillaries. It is established that in postcapillary venules, preformed P-selectin is present in Weibel-Palade bodies of endothelial cells and can be rapidly mobilized to the endothelial surface in response to inflammatory stimuli (41, 42). In contrast, capillary endothelial cells have rarely been observed to express P-selectin, even in response to strong inflammatory stimulation (8, 41). Similarly, in resting glomerular capillaries, P-selectin expression is undetectable, suggesting that glomerular endothelial cells do not express preformed P-selectin (20, 24). However, glomerular P-selectin expression increases in response to stimulation with anti-GBM Ab and in other models of inflammation (20, 24, 43, 44, 45). There is evidence that glomerular endothelial cells have the capacity to express P-selectin (45). However, in anti-GBM glomerulonephritis, studies of chimeric mice demonstrated that glomerular P-selectin expression occurred only in mice in which P-selectin was restricted to platelets (24). These findings support the present findings that in anti-GBM Ab-induced glomerular inflammation, platelets are the key source of glomerular P-selectin expression. Despite the absence of detectable leukocyte rolling, our data also indicate that recruitment in glomeruli involves nonredundant roles for selectins and leukocyte integrins. One interpretation of these findings is that the conventional multistep cascade remains functional under these conditions, but occurs within a subsecond time scale. It is established that in response to appropriate leukocyte-activating stimuli such as chemoattractants, β2 integrins can be activated to a functionally active form extremely rapidly (46). The source of this putative stimulus in this model of glomerular inflammation remains unclear. Previous work has indicated that the complement pathway is not essential for leukocyte recruitment and full expression of disease in this model, suggesting that complement-derived chemoattractants are not responsible (20). Alternatively, signals mediated via leukocyte-expressed selectin ligands such as PSGL-1 may serve this function, because ligation or cross-linking of PSGL-1 has been shown to promote β2 integrin-mediated leukocyte adhesion (47). To visualize the glomerular microvasculature, we used the technique of hydronephrosis (13, 25, 48, 49). Given the possibility that the process of hydronephrosis may have impacted upon glomerular function, we examined various parameters to assess the inflammatory response in glomeruli of hydronephrotic kidneys. Endpoints such as glomerular localization of anti-GBM Ab, accumulation of neutrophils and platelets, P-selectin up-regulation, and C3 deposition did not differ between contralateral and hydronephrotic kidneys. These findings support the contention that the mechanisms of leukocyte recruitment revealed by direct visual assessment of glomeruli in hydronephrotic kidneys accurately reflect the mechanisms functioning in unaltered kidneys. It is noteworthy that a previous study using this approach to examine the role of selectins in anti-GBM Ab-induced recruitment observed no effect of fucoidan, a selectin-blocking agent, on glomerular leukocyte adhesion (13). It is unclear why the present findings differ from these observations. However, in our hands, extensive exposure of the glomerulus to fluorescent illumination can render recruitment selectin-independent. To avoid this issue, we routinely restricted the length and frequency of our observations. The present data are in contrast to previous studies of neutrophil-mediated glomerulonephritis in P-selectin−/− mice in which the absence of P-selectin was associated with increased glomerular leukocyte recruitment (23), findings not consistent with earlier studies using anti-P-selectin Abs in comparable models (20, 22). The reasons for these discrepancies are not clear. It is noteworthy that, in our hands, P-selectin blockade, P-selectin deficiency, and PSGL-1 blockade consistently resulted in reduced leukocyte recruitment. Given the fact that the observations in the present study were restricted to the first 2 h of the response, the possibility that P-selectin-independent mechanisms of leukocyte recruitment, e.g., E-selectin, become functional after this time cannot be excluded. This eventuality would allow recruitment to proceed in P-selectin-deficient mice. However, the mechanisms whereby recruitment and renal injury may be increased by the absence of P-selectin remain unclear. In vivo microscopy studies of the liver have demonstrated that despite leukocytes being capable of undergoing arrest in hepatic sinusoids, leukocyte rolling is not observed in these narrow vessels. Moreover, interventions that prevent rolling in postcapillary venules in other vascular beds have no effect on leukocyte recruitment to hepatic sinusoids (11, 50). These findings suggest that rolling is not necessary for recruitment at these sites. However, it is noteworthy that this recruitment is not due to adhesion molecule-independent leukocyte trapping in narrow vessels, because ICAM-1 is required for FMLP-induced leukocyte adhesion in hepatic sinusoids (11). Similarly, recent data demonstrate a role for the α4 integrin and vascular adhesion protein-1 in adhesion of Th1 and Th2 lymphocytes, respectively, in sinusoids in the inflamed liver, demonstrating that recruitment to this capillary bed retains a requirement for an adhesion molecule-mediated leukocyte-endothelial cell interaction (51). Our observations indicate that a similar process occurs in the glomerulus. Despite the fact that leukocytes must deform to transit the narrow glomerular capillaries, leukocyte adhesion in these vessels requires a complex adhesion molecule-mediated interaction between the leukocyte and endothelial cells. The complexity of this interaction is increased by the key role of platelets that accumulate in glomerular capillaries and provide a source of one of the critical adhesion molecules in this response, P-selectin. ↵1 This work was supported by a Program Grant from the National Health and Medical Research Council (NHMRC), Australia (ID no. 334067). M.J.H. is a NHMRC RD Wright Fellow. ↵3 Abbreviations used in this paper: GBM, glomerular basement membrane; PSGL-1, P-selectin glycoprotein ligand 1. Muller, W. A.. 2002. Leukocyte-endothelial cell interactions in the inflammatory response. Lab. Invest. 82: 521-533. Lindbom, L., X. Xie, J. Raud, P. Hedqvist. 1992. Chemoattractant-induced firm adhesion of leukocytes to vascular endothelium in vivo is critically dependent on initial leukocyte rolling. Acta Physiol. Scand. 146: 415-421. Mayadas, T. N., R. C. Johnson, H. Rayburn, R. O. Hynes, D. D. Wagner. 1993. 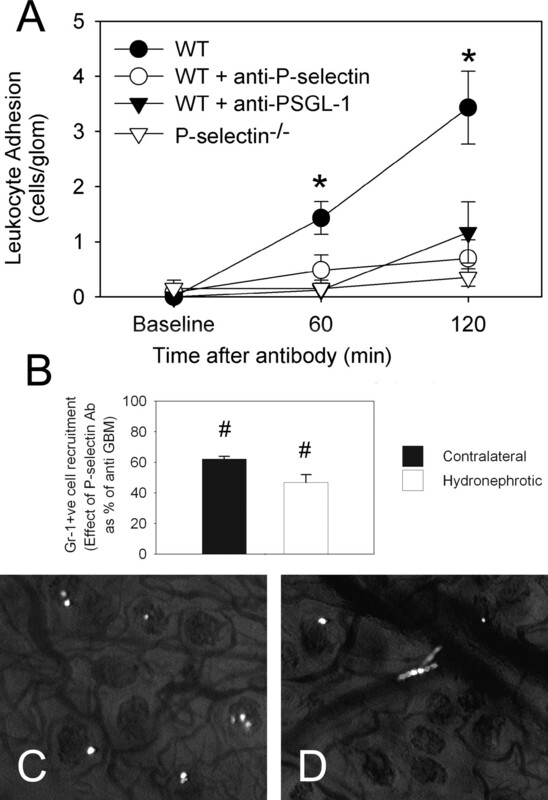 Leukocyte rolling and extravasation are severely compromised in P selectin-deficient mice. Cell 74: 541-554. Bullard, D. C., E. J. Kunkel, H. Kubo, M. J. Hicks, I. Lorenzo, N. A. Doyle, C. M. Doerschuk, K. Ley, A. L. Beaudet. 1996. Infectious susceptibility and severe deficiency of leukocyte rolling and recruitment in E-selectin and P-selectin double mutant mice. J. Exp. Med. 183: 2329-2336. Kanwar, S., D. C. Bullard, M. J. Hickey, C. W. Smith, A. L. Beaudet, B. A. Wolitzky, P. Kubes. 1997. The association between α4-integrin, P-selectin, and E-selectin in an allergic model of inflammation. J. Exp. Med. 185: 1077-1087. Ley, K., P. Gaehtgens. 1991. Endothelial, not hemodynamic, differences are responsible for preferential leukocyte rolling in rat mesenteric venules. Circ. Res. 69: 1034-1041. Jung, U., K. Ley. 1997. Regulation of E-selectin, P-selectin, and intercellular adhesion molecule 1 expression in mouse cremaster muscle vasculature. Microcirculation 4: 311-319. Ley, K., J. U. Meyer, M. Intaglietta, K. E. Arfors. 1989. Shunting of leukocytes in rabbit tenuissimus muscle. Am. J. Physiol. 256: H85-H93. Downey, G. P., D. E. Doherty, B. Schwab, 3rd, E. L. Elson, P. M. Henson, G. S. Worthen. 1990. Retention of leukocytes in capillaries: role of cell size and deformability. J. Appl. Physiol. 69: 1767-1778. Wong, J., B. Johnston, S. S. Lee, D. C. Bullard, C. W. Smith, A. L. Beaudet, P. Kubes. 1997. A minimal role for selectins in the recruitment of leukocytes into the inflamed liver microvasculature. J. Clin. Invest. 99: 2782-2790. Downey, G. P., G. S. Worthen, P. M. Henson, D. M. Hyde. 1993. Neutrophil sequestration and migration in localized pulmonary inflammation: capillary localization and migration across the interalveolar septum. Am. Rev. Respir. Dis. 147: 168-176. De Vriese, A. S., K. Endlich, M. Elger, N. H. Lameire, R. C. Atkins, H. Y. Lan, A. Rupin, W. Kriz, M. W. Steinhausen. 1999. The role of selectins in glomerular leukocyte recruitment in rat anti-glomerular basement membrane glomerulonephritis. J. Am. Soc. Nephrol. 10: 2510-2517. Huang, X. R., S. R. Holdsworth, P. G. Tipping. 1994. Evidence for delayed-type hypersensitivity mechanisms in glomerular crescent formation. Kidney Int. 46: 69-78. Huang, X. R., S. R. Holdsworth, P. G. Tipping. 1997. Th2 responses induce humorally mediated injury in experimental anti-glomerular basement membrane glomerulonephritis. J. Am. Soc. Nephrol. 8: 1101-1108. Neale, T. J., P. G. Tipping, S. D. Carson, S. R. Holdsworth. 1988. Participation of cell-mediated immunity in deposition of fibrin in glomerulonephritis. Lancet 2: 421-424. Nishikawa, K., Y. J. Guo, M. Miyasaka, T. Tamatani, A. B. Collins, M. S. Sy, R. T. McCluskey, G. Andres. 1993. Antibodies to intercellular adhesion molecule 1/lymphocyte function-associated antigen 1 prevent crescent formation in rat autoimmune glomerulonephritis. J. Exp. Med. 177: 667-677. Tang, T., A. Rosenkranz, K. J. Assmann, M. J. Goodman, J. C. Gutierrez-Ramos, M. C. Carroll, R. S. Cotran, T. N. Mayadas. 1997. A role for Mac-1 (CDIIb/CD18) in immune complex-stimulated neutrophil function in vivo: Mac-1 deficiency abrogates sustained FcγR-dependent neutrophil adhesion and complement-dependent proteinuria in acute glomerulonephritis. J. Exp. Med. 186: 1853-1863. Mulligan, M. S., K. J. Johnson, R. F. Todd, 3rd, T. B. Issekutz, M. Miyasaka, T. Tamatani, C. W. Smith, D. C. Anderson, P. A. Ward. 1993. Requirements for leukocyte adhesion molecules in nephrotoxic nephritis. J. Clin. Invest. 91: 577-587. Tipping, P. G., X. R. Huang, M. C. Berndt, S. R. Holdsworth. 1994. A role for P selectin in complement-independent neutrophil-mediated glomerular injury. Kidney Int. 46: 79-88. Janssen, U., T. Ostendorf, S. Gaertner, F. Eitner, H. J. Hedrich, K. J. Assmann, J. Floege. 1998. Improved survival and amelioration of nephrotoxic nephritis in intercellular adhesion molecule-1 knockout mice. J. Am. Soc. Nephrol. 9: 1805-1814. Tipping, P. G., X. R. Huang, M. C. Berndt, S. R. Holdsworth. 1996. P-selectin directs T lymphocyte-mediated injury in delayed-type hypersensitivity responses: studies in glomerulonephritis and cutaneous delayed-type hypersensitivity. Eur. J. Immunol. 26: 454-460. Mayadas, T. N., D. L. Mendrick, H. R. Brady, T. Tang, A. Papayianni, K. J. Assmann, D. D. Wagner, R. O. Hynes, R. S. Cotran. 1996. Acute passive anti-glomerular basement membrane nephritis in P-selectin-deficient mice. Kidney Int. 49: 1342-1349. Rosenkranz, A. R., D. L. Mendrick, R. S. Cotran, T. N. Mayadas. 1999. P-selectin deficiency exacerbates experimental glomerulonephritis: a protective role for endothelial P-selectin in inflammation. J. Clin. Invest. 103: 649-659. Steinhausen, M., H. Snoei, N. Parekh, R. Baker, P. C. Johnson. 1983. Hydronephrosis: a new method to visualize vas afferens, efferens, and glomerular network. Kidney Int. 23: 794-806. Kitching, A. R., S. R. Holdsworth, P. G. Tipping. 1999. IFN-γ mediates crescent formation and cell-mediated immune injury in murine glomerulonephritis. J. Am. Soc. Nephrol. 10: 752-759. Hickey, M. J., D. C. Bullard, A. Issekutz, W. G. James. 2002. Leukocyte-endothelial cell interactions are enhanced in dermal postcapillary venules of MRL/faslpr (lupus-prone) mice: roles of P- and E-selectin. J. Immunol. 168: 4728-4736. Carvalho-Tavares, J., M. J. Hickey, J. Hutchison, J. Michaud, I. T. Sutcliffe, P. Kubes. 2000. A role for platelets and endothelial selectins in tumor necrosis factor-α-induced leukocyte recruitment in the brain microvasculature. Circ. Res. 87: 1141-1148. Khan, A. I., S. M. Kerfoot, B. Heit, L. Liu, G. Andonegui, B. Ruffell, P. Johnson, P. Kubes. 2004. Role of CD44 and hyaluronan in neutrophil recruitment. J. Immunol. 173: 7594-7601. Lagasse, E., I. L. Weissman. 1996. Flow cytometric identification of murine neutrophils and monocytes. J. Immunol. Methods 197: 139-150. Norman, M. U., N. C. Van De Velde, J. R. Timoshanko, A. Issekutz, M. J. Hickey. 2003. Overlapping roles of endothelial selectins and vascular cell adhesion molecule-1 in immune complex-induced leukocyte recruitment in the cremasteric microvasculature. Am. J. Pathol. 163: 1491-1503. Kitching, A. R., A. L. Turner, T. Semple, M. Li, K. L. Edgtton, G. R. Wilson, J. R. Timoshanko, B. G. Hudson, S. R. Holdsworth. 2004. Experimental autoimmune anti-glomerular basement membrane glomerulonephritis: a protective role for IFN-γ. J. Am. Soc. Nephrol. 15: 1764-1774. Kitching, A. R., A. L. Turner, G. R. Wilson, K. L. Edgtton, P. G. Tipping, S. R. Holdsworth. 2004. Endogenous IL-13 limits humoral responses and injury in experimental glomerulonephritis but does not regulate Th1 cell-mediated crescentic glomerulonephritis. J. Am. Soc. Nephrol. 15: 2373-2382. Kitching, A. R., X. R. Huang, A. J. Ruth, P. G. Tipping, S. R. Holdsworth. 2002. Effects of CTLA4-Fc on glomerular injury in humorally-mediated glomerulonephritis in BALB/c mice. Clin. Exp. Immunol. 128: 429-435.
Cooper, D., K. D. Chitman, M. C. Williams, D. N. Granger. 2003. Time-dependent platelet-vessel wall interactions induced by intestinal ischemia-reperfusion. Am. J. Physiol. 284: G1027-G1033. Czuprynski, C. J., J. F. Brown, N. Maroushek, R. D. Wagner, H. Steinberg. 1994. Administration of antigranulocyte mAb RB6-8C5 impairs the resistance of mice to Listeria moncytogenes infection. J. Immunol. 152: 1836-1846. Wu, X., J. Pippin, J. B. Lefkowith. 1993. Attenuation of immune-mediated glomerulonephritis with an anti-CD11b monoclonal antibody. Am. J. Physiol. 264: F715-F721. Johnson, R. J., C. E. Alpers, P. Pritzl, M. Schulze, P. Baker, C. Pruchno, W. G. Couser. 1988. Platelets mediate neutrophil-dependent immune complex nephritis in the rat. J. Clin. Invest. 82: 1225-1235. Ideura, T., M. Ogasawara, S. Tomura, T. Ida, Y. Chida, R. Kuriyama, J. Takeuchi, T. Motomiya, H. Yamazaki. 1992. Effect of thrombocytopenia on the onset of immune complex glomerulonephritis. Nephron 60: 49-55. Massberg, S., G. Enders, R. Leiderer, S. Eisenmenger, D. Vestweber, F. Krombach, K. Messmer. 1998. Platelet-endothelial cell interactions during ischemia/reperfusion: the role of P-selectin. Blood 92: 507-515. McEver, R. P., J. H. Beckstead, K. L. Moore, L. Marshall-Carlson, D. F. Bainton. 1989. GMP-140, a platelet α-granule membrane protein, is also synthesized by vascular endothelial cells and is localized in Weibel-Palade bodies. J. Clin. Invest. 84: 92-99. Lorant, D. E., K. D. Patel, T. M. McIntyre, R. P. McEver, S. M. Prescott, G. A. Zimmerman. 1991. Coexpression of GMP-140 and PAF by endothelium stimulated by histamine or thrombin: a juxtacrine system for adhesion and activation of neutrophils. J. Cell Biol. 115: 223-234. Zachem, C. R., C. E. Alpers, W. Way, S. J. Shankland, W. G. Couser, R. J. Johnson. 1997. A role for P-selectin in neutrophil and platelet infiltration in immune complex glomerulonephritis. J. Am. Soc. Nephrol. 8: 1838-1844. Yuan, H. T., P. G. Tipping, X. Z. Li, D. A. Long, A. S. Woolf. 2002. Angiopoietin correlates with glomerular capillary loss in anti-glomerular basement membrane glomerulonephritis. Kidney Int. 61: 2078-2089. Nakatani, K., H. Fujii, H. Hasegawa, M. Terada, N. Arita, M. R. Ito, M. Ono, S. Takahashi, K. Saiga, S. Yoshimoto, et al 2004. Endothelial adhesion molecules in glomerular lesions: association with their severity and diversity in lupus models. Kidney Int. 65: 1290-1300. Constantin, G., M. Majeed, C. Giagulli, L. Piccio, J. Y. Kim, E. C. Butcher, C. Laudanna. 2000. Chemokines trigger immediate β2 integrin affinity and mobility changes: differential regulation and roles in lymphocyte arrest under flow. Immunity 13: 759-769. Atarashi, K., T. Hirata, M. Matsumoto, N. Kanemitsu, M. Miyasaka. 2005. Rolling of Th1 cells via P-selectin glycoprotein ligand-1 stimulates LFA-1-mediated cell binding to ICAM-1. J. Immunol. 174: 1424-1432. Buhrle, C. P., E. Hackenthal, U. Helmchen, K. Lackner, R. Nobiling, M. Steinhausen, R. Taugner. 1986. The hydronephrotic kidney of the mouse as a tool for intravital microscopy and in vitro electrophysiological studies of renin-containing cells. Lab. Invest. 54: 462-472. Steinhausen, M., B. Zimmerhackl, H. Thederan, R. Dussel, N. Parekh, H. U. Esslinger, G. von Hagens, D. Komitowski, F. D. Dallenbach. 1981. Intraglomerular microcirculation: measurements of single glomerular loop flow in rats. Kidney Int. 20: 230-239. Fox-Robichaud, A., P. Kubes. 2000. Molecular mechanisms of tumor necrosis factor α-stimulated leukocyte recruitment into the murine hepatic circulation. Hepatology 31: 1123-1127. Bonder, C. S., M. U. Norman, M. G. Swain, L. D. Zbytnuik, J. Yamanouchi, P. Santamaria, M. Ajuebor, M. Salmi, S. Jalkanen, P. Kubes. 2005. Rules of recruitment for Th1 and Th2 lymphocytes in inflamed liver: a role for α4 integrin and vascular adhesion protein-1. Immunity 23: 153-163.